True to its title, The Listening is an album in love with the simple joys of listening to pop music. 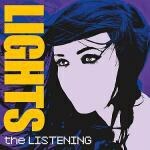 Lights, the appropriately incandescent alias of 22-year-old Canadian singer/songwriter Valerie Poxleitner, made the best pop record that you probably did not hear in 2009. Despite what would appear to be a reasonably marketable pop-pixie image and smooth New Wave-lite sound capable of evoking both fond nostalgia in older listeners and fashionable cool in kids weaned on The Postal Service, she has yet to receive much exposure beyond Canadian music television, where several of her colorful anime-esque videos have been in consistent rotation since she released her self-titled debut EP in 2008. It leads one to wonder if perhaps there is a small danger of the sheer retro-ness of her image—she plays a keytar, that moldy artifact of '80s cheese, with the same breezy lack of irony with which she drops a lyrical reference to “Ice Ice Baby” into one of her songs—making her difficult to locate amid the increasingly complex landscape of 21st century pop. Indeed, Lights foregoes the tendency among today’s crop of young female pop stars to make themselves comfortably amorphous in the hands of superstar European knob-twiddlers or American R&B beat-savants in favor of a sound that, for all of it’s glistening studio sheen, feels warmly, almost quaintly, homemade. And as far as studio pop goes, it may as well have been: Lights writes or co-writes as well as co-produces all of her material, in addition to designing her own album art. Make no mistake that Lights is a pop construct every bit as self-aware as Lady Gaga, equally evocative of the various popular innovations of '80s music and culture, but more fixated on New Wave’s retro-futuristic take on melodic pop than on the decade’s expanding possibilities for trend-establishing dance music. Think of Lights, maybe, as Gaga’s introverted kid sister, more at home in her bedroom scribbling adolescent poetry than sneaking into clubs. The Listening imports four of the six songs from the earlier EP in slightly (if unrecognizably) tweaked forms: the graceful, humming “Drive My Soul” gliding like a Moby-scored luxury car ad humanized by Lights’ yearning pleas; the jerky, robotic synth beats of “Ice” matching the song’s cool sass with Lights’ inherent compassion; the gently encouraging “The Last Thing on Your Mind” shifting smoothly between a mid-tempo twitch and melodramatic American Idol-style showpiece balladry; the tasteful, very of-the-moment Postal Service-style glitch beats underscoring a chorus of epic heartbreak (“my arms get cold / in February air / please don’t lose hold of me out there”) that would have sounded timeless in any pop generation. Two years ago, these songs sounded promising enough, refreshingly catchy and sincere slices of retro-pop in a mainstream that, for all of its exciting embrace of avant-leaning production techniques in recent years, sometimes felt like it had traded off the ability to craft simple, indelible melodies as a result. Here, woven into the fabric of her debut album, their familiarity (to those of us who heard them the first time around) has rendered them as classic as a childhood favorite. The Listening does little more than add eight more shimmering pop gems to Lights’ small catalogue, but it doesn’t have to do anything else. Opener and lead single “Saviour” shifts between meticulous pitter-patter verses and a chorus hook as blissful as any since “Manic Monday”. “River” follows a nearly structurally identical pattern, but increases its epic reach by several degrees. “The Listening” itself is like a halfway merger between Kate Bush and Kylie Minogue (both of whom Lights resembles vocally at various points), the former’s breathy ethereality wrestling with the latter’s retro-disco mid-tempo groove. “Pretend” is a strategically placed mid-album ballad that is nevertheless wise enough to recognize that Lights’ songs always require a strong pulse at their center (something that, in the album’s only severe misstep, the closing piano reprise of the song does not). The busy “Second Go” (containing what is, coming from her, the scoff-worthy lyric “how can you love me when I am ugly?”) offers comforting advance proof that Lights’ songs are solid enough in their melodic foundations to survive their own inevitable dance remixes. “Face Up” is awash in inspirational sentiment, but Lights’ naïve conviction and powerful sense of sonic dynamics completely sells it. “Lions!” integrates an expertly processed Edge-like guitar chime into a sturdy dance-floor groove, an object lesson in why so much of the Pink/Kelly Clarkson branch of “pop rock” sounds, at least to this frequently beleaguered pop fan, so needlessly drab. The squeaky, cartoonish “Quiet” is enough to suggest that if Lights is the true heir to any veteran pop star, its Cyndi Lauper. If The Listening is steeped in a past that pre-dates the artist herself, if just barely, Lights has nevertheless made a record that strikes a balance between that past and her own era in a way that would not have been possible in any other. The Listening is, finally, an album that combines the bedroom-intimacy and childlike enthusiasm of indie-pop with the no-expense-spared production values of blockbuster studio pop. It is the album that Liz Phair or Nina Gordon might have made had they explored their mainstream impulses at a much younger and less savvy age (and, in Phair’s case, had better taste in collaborators than the Matrix), and the album Britney Spears might have made if she had ever heard of Sarah Records, an album that connects pop’s grandest impulses with its quaintest. More than anything, it is an album that, true to its title, is in love with the simple joys of listening to pop music.